To continue to keep ticket prices low and accessible for all for 24-HOUR DRONE: EXPERIMENTS IN SOUND AND MUSIC, our season opener, we are seeking support from people like you! 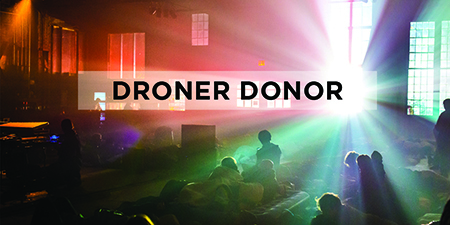 DRONER DONORS will help support 24 acts and roughly 100+ individual artists who participate in this immersive, communal endurance event. 24-HOUR DRONE is a shared experience for participants and audience alike, and it needs to grow to continue to touch new hearts + ears. Artists participating in 24-HOUR DRONE are paid a modest honorarium, choosing heart + spirit over monetary gain, because they believe in this program. We strive to serve artists within our limited resources, and it’s amazing what we’ve been able to accomplish together thus far. Consider making a tax-deductible donation to support an artist, and help ensure 24-HOUR DRONE persists! Donations of any amount help, so surprise us!